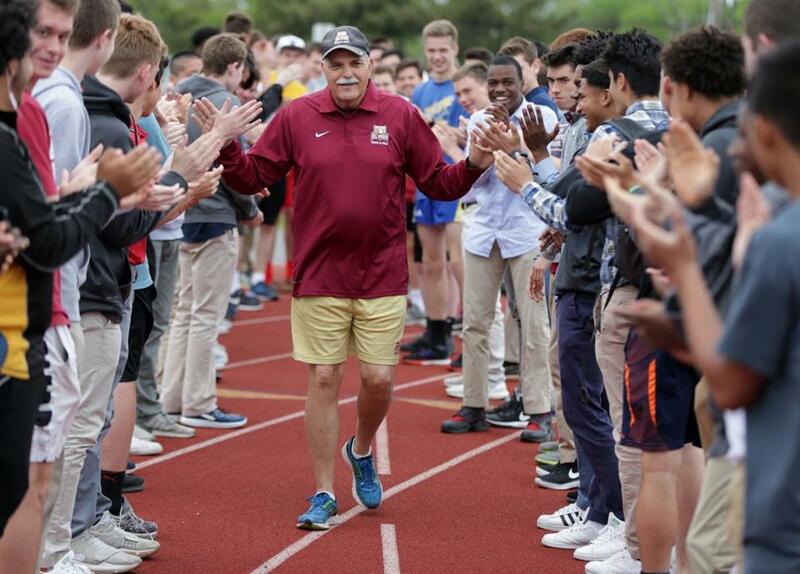 BC High track and field coach John Normant, who announced his retirement after 50 years at the school, shared high-fives with the student body. For 15 minutes on Wednesday afternoon, most of the athletic facilities on the BC High campus were deserted. 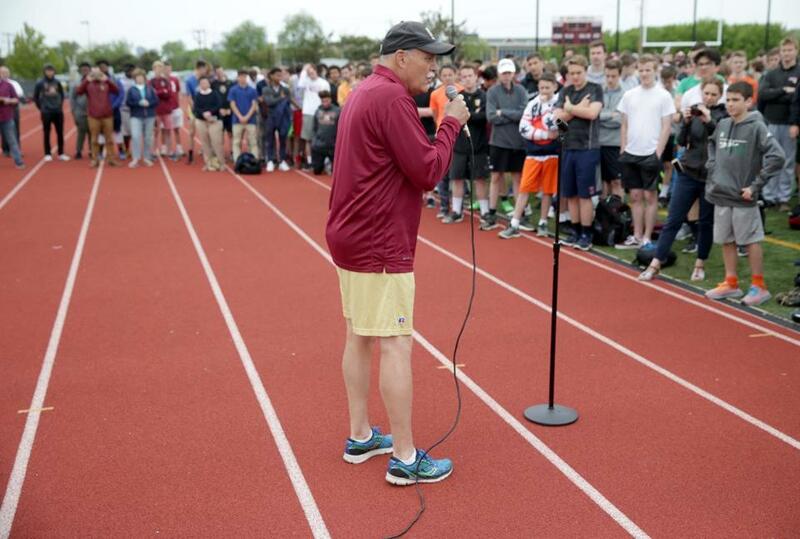 Instead of practicing, the entire student body, including the spring athletes and their coaches, gathered on the football field to pay tribute to retiring track coach John Normant, giving a standing ovation to a man who spent the last 50 years at his alma mater as a coach and educator. But the ceremony only brushed the surface. If everyone Normant impacted over his time with the Eagles had shown up, athletic director Jon Bartlett might have needed to start construction on a stadium expansion. With his wife, Anne Marie, and son, Michael, along side, Normant told his track team of his retirement in a private team meeting before addressing the crowd. A 1964 BC High alumnus, he reflected on his time at the school and also cracked some jokes, attempting to recruit some of the athletes present to run indoor track. John Normant addresses BC High’s student body and faculty on the subject of his retirement. 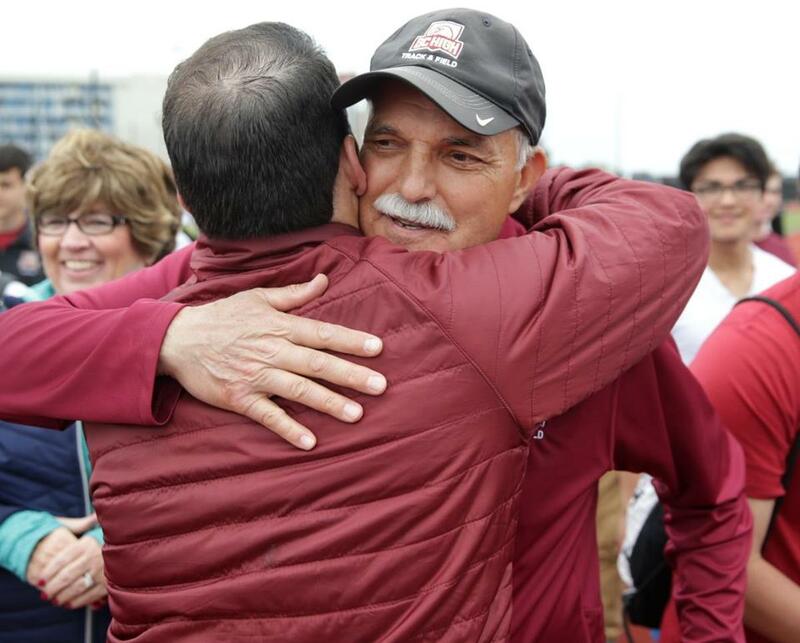 Normant, who has been coaching at BC High since 1968 and teaching math since 1982, led the Eagles to consistent success across all three sports seasons, including a Division 1 indoor track championship in 2009. “He’s meant a lot,” said senior captain Andrew Murray. “He’s kind of been the rock that’s always been here. He’s always out here. He’s the first one out here, last one putting things away, giving up countless hours, countless Saturday mornings at either practice or track meets. Normant’s team was taken aback by the announcement, but heaped praise on their departing coach for the time and effort he devoted to the school. John Normant accepts a hug from a well-wisher after his brief retirement ceremony Wednesday. “He is a BC High man,’’ senior track co-captain Chris McCarthy said of his beloved coach.